MTN Nigeria owns 41.5% of GSM communications market, which is 62.5 million subscribers. For this reason, many terminators are interested in connecting to this operator. However, MTN Nigeria offers 3 main packages - MTN XtraValue, MTN StartPack, and MTN BetaTalk. MTN XtraValue is available in several variations of tariff plans - Xtra Talk, XS, S, M, L, and XL. And for first time users there are specially designed packages MTN StartPack and MTN BetaTalk, providing bonuses when SIM-cards are activated. The cheapest of the above tariff plans are XS and MTN BetaTalk. When you activate them, a minute of conversation will cost you $0.00047, with MTN BetaTalk accruing bonus of 200% when the number is activated. VoIP MTN solutions are the most beneficial. Many terminators are using S and MTN StartPack packages. However, a minute of conversation here will cost a bit more - $0.00108. MTN StartPack allows customers to receive bonuses of 500% after the SIM-card is installed. To receive the bonus, you need to top up your account with $0.32 so that you have $ 1.60 on the bonus account. The third tariff plan that is suitable for termination is the M package, with cost per minute being $0.00216. All others are more expensive or have other conditions that are unacceptable for the termination. 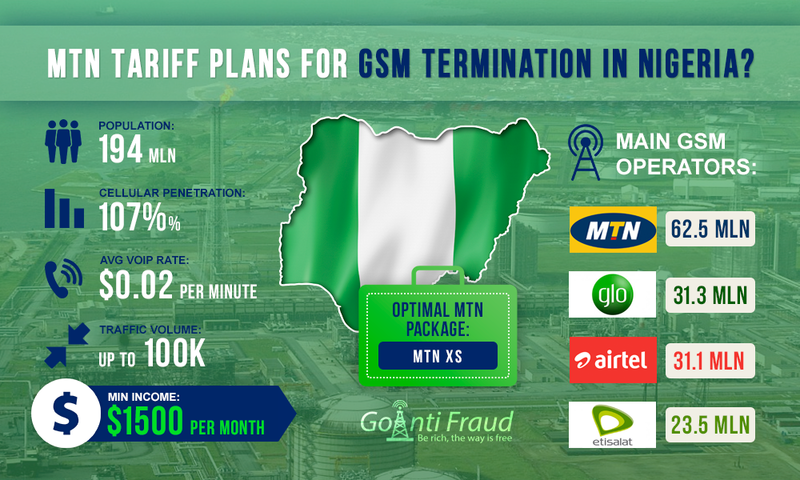 By the way, MTN Nigeria tariff plans are the most beneficial for GSM termination as compared with the proposals of other operators. All of the above packages can be topped up with a different amount. The operator does not limit its subscribers. Moreover, the demand for MTN traffic landing in Nigeria is much greater than the final termination traffic of other operators. There are quite many offers to buy VoIP traffic on the forums. Originators offer around $ 0.0233 for landing Nigeria Mobile MTN. Based on the above rates, the difference in earnings is easy to calculate. Revenue will be $0.022- $0.0023 per minute. When you have multi-channel equipment operating, the minimum income will be about $3,000 within 2-3days. To increase profits, you can connect to GoAntiFraud. It is capable of ensuring a long life of SIM-cards and keeping them from locking. GoAntiFraud will help you bypass the toughest operator antifraud. The migration of SIM cards is one of the main conditions for a successful termination, and this feature is available for our customers, among many other efficient tools. Simulating the human behavior is real, thanks to our service.